According to a 2005 Gallup poll, 37 percent of Americans believe in haunted houses, and according to a 2013 HuffPost/YouGov poll, 45 percent believe in ghosts. These are surprising numbers, but the next time you hear a spooky sound, don't call the Ghostbusters—get a scientist instead. Behind every shadow, poltergeist, and disembodied voice, there's a perfectly rational explanation. Frightened witnesses all over the world have seen the shadow people. These dark beings are glimpsed out of the corner of the eye only to vanish when confronted. Many believe them to be demons, some think they're astral bodies, and some say they're time travelers, here for a second and gone. However, some researchers have a more shocking theory. When Swiss scientists electrically stimulated an epileptic patient's brain, things got really spooky. The patient reported a shadow person sitting behind her, copying her every move. When she sat up, it also sat up. When she bent forward and grabbed her knees, it reached around her body and held her. The doctors then told her to read a card, but the shadow person tried to take it out of her hand. What happened was the scientists had stimulated the left temporoparietal junction, the part of the brain that defines the idea of self. By interfering with the area that helps us tell the difference between ourselves and others, the doctors screwed up the brain's ability to understand its own body, thus leading to the creation of a copycat shadow person. Researchers are hoping this is the key to understanding why so many people, both schizophrenic and healthy, encounter shadow beings and other creatures like aliens. The Spiritualist movement was pretty big in the 1840s and 1850s. It provided a way for people to talk to their dead loved ones. One method of communication was the Ouija board. Still popular today, the board was covered in letters, numbers, and simple words (like "yes" or "no"). People would then place their hands on a wooden piece called a planchette and ask the spirits a question. A ghost would respond by moving the planchette from letter to letter, spelling out a response (or unleashing Captain Howdy). Another creepy method for interacting with spirits was table tilting. During a séance, people would gather round a table and place their hands on the tabletop. To everyone's surprise, the table would start moving by itself. It might tilt up on one leg, levitate off the ground or scoot around the room. Con men were definitely involved in some of these incidents, but were all these encounters frauds? Renowned physicist Michael Faraday wanted to find out. Through clever experimentation, Faraday discovered that the tables were often moving thanks to the ideomotor effect. This is when the power of suggestion causes our muscles to move unconsciously. People expected a table to move so they unintentionally moved it. A similar event took place in 1853 when four doctors held an experimental séance. When they secretly told half the participants the table would move to the right and half it would move left, the table didn't budge. But when they told everyone it would move in one direction, the ideomotor effect struck again! This same principle applies to the Ouija board. It's our own muscles that are doing the spelling, not the spirits. After seeing a gray ghost near his desk, researcher Vic Tandy was worried his laboratory might be haunted. But the next day, Tandy made an interesting discovery. While preparing for a fencing match, Tandy placed his sword in a vise. He then noticed the blade was vibrating on its own. All of a sudden, everything clicked. He realized the force causing his sword to shake was the same force haunting his lab. Vic Tandy was dealing with infrasound. Humans can hear sounds up to 20,000 Hertz, but we're unable to detect anything lower than 20 Hz. These "silent" noises are called infrasound, and while we can't hear them, we can feel them in the form of vibrations. Dr. Richard Wiseman says we can feel these waves, especially in our stomachs, and this can create either a positive feeling (such as awe) or a negative feeling (such as unease). In the right surroundings (see "creepy house"), this might create a sense of panic. Infrasound can be produced by storms, wind, weather patterns, and even everyday appliances. Returning to Vic Tandy, after witnessing his wobbling sword, he learned that a new fan had been installed in his laboratory, and sure enough, it was issuing vibrations of about 19 Hz. Since our eyeballs have a resonant frequency around 20 Hz, the infrasound was vibrating Tandy's eyeballs and creating images that weren't really there. When Tandy turned off the fan, presto: no more ghost. Similarly, Dr. Wiseman believes these vibrations are responsible for paranormal activity in "haunted" locations. For example, when investigating two underground sites, he discovered evidence of infrasound coming from the traffic overhead. Wiseman thinks this explains the ghostly figures and creepy footsteps in these areas, proving there's nothing good about these vibrations. What do witch doctors and Shirley MacLaine have in common? They're all big into channeling! Channeling is one of mankind's oldest attempts to reach the spirit world. The idea is to clear the mind, connect with some sort of cosmic consciousness and let a centuries-old spirit possess your body, which doesn't sound creepy at all. The shamans of ancient religions were believed to channel the dead, TV psychic John Edward says he can speak to those who've crossed over, and medium J.Z. Knight claims she channels a spirit named Ramtha, a 35,000-year-old spirit from Atlantis. Obviously, there are quite a few frauds in the channeling community, but what about the people who sincerely believe in what they're doing? The answer is automatism, an "altered state of consciousness" where people say things and think things they're not aware of. So when a psychic clears his mind, he starts searching for a friendly spirit guide. The spirit guide is supposed to enter his body and then provide secret knowledge about the universe. When the psychic clears his mind, random ideas and images start popping up in his head, and the medium assumes these thoughts are coming from another entity. However, these ideas are just coming from his mind. Our brains are capable of coming up with all kinds of crazy stuff without any conscious effort on our part. How many times has something inspired you out of the blue? How many times have you had totally bizarre nightmares or daydreams? That's not the work of an otherworldly guide. That's your brain, working overtime all the time. You're exploring a creepy, run-down mansion in the middle of the night when suddenly the air grows cold. However, if you take a few steps to the left or right, the temperature returns to normal. This is what parapsychologists call a cold spot. According to ghost hunters, a cold spot is a sign of paranormal activity. When a ghost has nothing better to do than appear out of thin air and scare people to death, it needs energy. So the ghost draws heat from its surroundings (including people) in order to manifest. However, scientists have a much simpler (and much more boring) explanation. When skeptics investigate "haunted" houses, they usually find cool air entering the house through a chimney or window. But even if the room is sealed off, there's still a perfectly rational explanation. Every object has its own temperature, and some surfaces are hotter than others. In an attempt to equalize the room temperature, the objects try to lose heat in a process called convection. This is where hot air rises, and cool air drops. Similarly, when dry air enters a humid room, the dry air sinks to the floor and the humid air rises to the ceiling. This swirling air will feel cool against a person's skin, giving the impression of a cold spot. Next time you feel a ghostly presence, turn on the heater. Ghost hunters have a love-hate relationship with orbs. These glowing balls of light are supposedly the spirits of people who've passed away, but haven't quite passed on. Invisible to the eye, orbs can only be seen in photographs, and that's where things get tricky. Skeptic Brian Dunning says when a dust speck or bug is too close to the camera, it will show up in the photo as a blurry, out-of-focus circle. And thanks to the camera flash, the orb will appear to be glowing and is thus mistaken for a ghost. Perfectly reasonable mistake, right? Even most believers are pretty skeptical about orb photography. While she thinks some real photos exist, parapsychologist Pamela Heath points out several natural causes of orbs such as fine hairs, dirty or wet lenses, lens reflection, or movement during exposure. 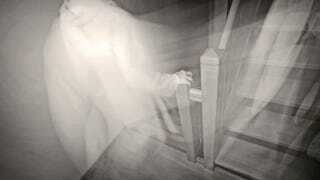 Many paranormal websites have stopped accepting these photos because they say there are just too many false ones. So thanks to a basic understanding of how technology works, orb photos seem to be giving up the ghost. In 1921, ophthalmologist William Wilmer published a bizarre paper in the American Journal of Ophthalmology. It told the story of the "H" family and their haunted house. Their hell home was plagued with the sounds of slamming doors, moving furniture and footsteps in empty rooms. One of the children felt something sitting on him while the other was attacked by a mysterious stranger. During the night, the woman of the house awoke to see a man and a woman standing at the foot of her bed, only to watch them vanish moments later. As the hauntings continued, the family grew tired and depressed, and then their plants started to die. It was then they discovered the faulty furnace. The furnace was supposed to send its fumes up the chimney, but instead the gas was pouring into the house. It turns out the family was suffering from carbon monoxide poisoning. Carbon monoxide (CO) is an odorless, colorless gas, which makes it really hard to detect. It's dangerous because our red blood cells absorb CO much easier than they do oxygen, and this oxygen deprivation leads to symptoms such as weakness, nausea, confusion, and eventually death. But before you kick the bucket, you might experience hallucinations, just like the "H" family. For example, in 2005, a woman called the authorities after seeing a spirit in her bathroom. It turned out the paranormal activity was due to her leaky water heater which was filling the house with CO. Bottom line: Stay away from carbon monoxide, folks, because one way or another, it'll have you seeing ghosts. In June 2013, over 3,000 workers went on strike at a garment factory in Gazipur, Bangladesh. They weren't protesting against long working hours, and they weren't demanding better wages. They wanted someone to do something about the ghost in the restroom. An angry spirit had attacked a worker in the lady's room, causing everyone to panic. A riot ensued, and the police had to restore order. A similar event took place at a school in Patong, Phuket when 22 students were hospitalized after seeing the ghost of an old woman. But while the Bangladeshi factory owner ordered an exorcism, perhaps he should have called a counselor instead. Both the workers and the students experienced a psychological phenomenon known as mass hysteria. These collective delusions occur when people are really stressed out, usually thanks to their oppressive environments (like a strict school or busy workplace). This pent-up stress then turns into physical symptoms like headaches, nausea, or violent spasms. Throw in religious and cultural beliefs, a relatively isolated environment and the always-busy rumor mill, and you've got a recipe for disaster. Other people will "catch" the same strange symptoms, they'll spread like a disease, and panic ensues. It's interesting to note that very few of the 3,000 factory workers actually encountered the ghost. Even the woman who sparked the frenzy didn't actually see anything. She got sick and just assumed it was the work of an evil spirit, but the suggestion was so powerful and the circumstances were so perfect that everyone freaked out. Fortunately, it didn't end with human sacrifices or dogs and cats living together. Unfortunately, real ghost hunters don't carry proton packs. However, they do use tools such as the ion counter. The ion counter, well, counts ions. An ion is an atom with an uneven amount of protons and electrons. If an atom gains an electron, it becomes a negative ion, and if it loses an electron, it becomes positive. Ghost hunters go crazy over ions because they supposedly show a paranormal presence. Some say a spirit's presence interferes with the normal ion count in the atmosphere while others say ghosts draw upon ionic energy when they want to appear and scare people to death. However, ion counters are really pretty lousy when it comes to detecting ghosts. Ions are caused by all kinds of natural phenomena like weather, solar radiation, and radon gas. So it basically comes down to how someone interprets the evidence. Scientists see ions and think, "Natural." Ghost hunters see ions and think, "Paranormal!" Interestingly, both positive and negative ions can affect our moods. Negative ions can make us feel calm and relaxed while positive ions can give us headaches and make us feel lousy. This might explain why people who live in "haunted" houses describe feeling tired and tense, as well as having headaches. Quantum mechanics is the study of the smallest types of matter, and it has led to some pretty awesome inventions. However, it can get pretty weird when physicists start talking about souls and ghosts. Take, for example, Dr. Stuart Hameroff and his physicist friend Roger Penrose. Hameroff and Penrose theorize that human consciousness comes from microtubules inside our brain cells, and these tubules are responsible for quantum processing (our souls basically). Hameroff and Penrose believe when people have a near-death experience, all that quantum information leaves the brain, yet continues to exist, which is why some people report out-of-body experiences and lights at the end of tunnels. As you might expect, a lot of scientists have problems with Hameroff and Penrose's theory. But Dr. Henry Stapp isn't one of them. As a respected quantum physicist who worked with the famous Heisenberg, Stapp believes that a person's personality might be able to survive death and exist as a "mental entity." Stapp theorizes if these entities could return to the physical world, then concepts like possession and channeling could really be possible. Are men like Stapp, Hameroff, and Penrose just wishful thinkers? Or are they modern day Galileos?